AP ICET 2019: Sri Venkateswara University on the behalf of APSCHE, Hyderabad conducts AP ICET. AP ICET is an acronym for Andhra Pradesh Integrated Common Entrance Test. It is being conducted in the month of May every year to provide admission into MBA and MCA courses. The Admission will be provided into various universities and their affiliated institutions. It is an important state level examination, and that’s why we are here trying to help you to join all the pieces of this puzzle. We are providing all the information you will need to appear in the exam. Like how to fill AP ICET Application Form, What will be the New syllabus and how you can download Admit card. You will get everything just here….. Without any surprise, AP ICET will be conducted in the middle of year probably in the month of May 2019. The Authority will release the notification and dates but we are providing here all the events and their tentative AP ICET Dates. So you are here because you want to know about this Exam and maybe you want to Apply for it. Good, But Before jumping to the Application Form section, checks the AP ICET Eligibility Criteria first. Because candidates will be only allowed after fulfilling all the eligibility criteria. The Application form will be available through Online Mode on the official website. Candidate can access the application form 1st week of March 2019. All the interested candidates have to visit the official website. The AP ICET Application Form can be accessed until the first week of April. Candidate has to visit the official website and do the registration. After it they have to log in on the site and fill the Application form. Make sure to fill the application form correctly, without any mistake. Take a print out of the filled application form and pay the fee. Candidates can pay the application fee through AP Online Centers, Citizen Service Centers, e-Seva Centers in State or through Credit and Debit cards. AP ICET 2019 Application Fee is Rs. 550/-. Form Can be also submitted after the last date with late fine i.e. Rs. 2000/-. As we indicated earlier in the Introduction, We are now providing all the information and Content for the Examination Preparation. Here is the basic of the exam AP ICET Exam Pattern. Draw up a realistic timetable. It’s never too late. Organise yourself. Clear notes, tidy folders. Don’t stress yourself out. Don’t prioritize any one subject. All subjects should get equal time. 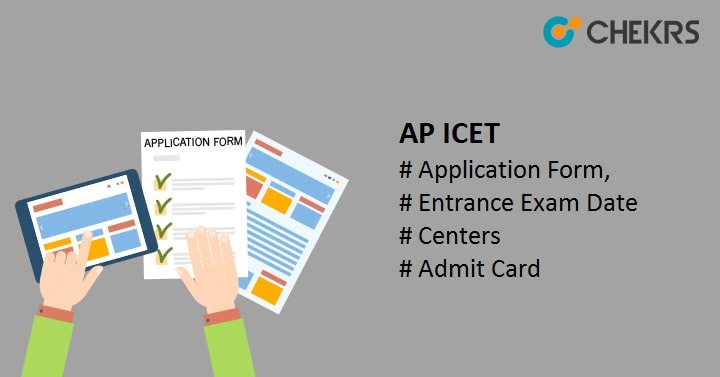 AP ICET Admit card will be released in last week of April 2019 online on the official website. Candidates need to go to the official website and enter your Application number or DOB to access and download the Andhra Pradesh ICET Hall Ticket. Hall ticket will be also required at the examination center for candidate verification. So make sure to carry the admit card with a photo id to the examination center to make thing easy for yourself on the exam day. The AP ICET Answer Key will be released in next few days after the exam. Candidates can download the answer key from the official website. Candidates can also estimate their marks by adding 1 mark for each correct answer. Candidates can also raise an objection if they found any mistake in The Answer key. They have to write an Email to the Authority with all the proper details. The Result will be declared online on the official website. All the candidates who appeared in the examination have to enter asked details to access AP ICET Result. After the result declaration candidates will be informed about it. Candidates have to visit the official website and they have to find the result link there. 50 marks out of 100 marks (25%) are required to qualify the Examination, and there are no qualifying marks for SC/ST category. Exam Authority will also release Rank list or AP ICET 2019 Merit list. The Counselling is expected to be started from the month of July 2019. Qualified Candidates will be allowed to for the Choice/ College filling. After It Seat will be allotted to the qualified students on the basis of their Rank list, Performance, Category, seat availability, and reservation. After it, the candidates need to report to the Aloted center/ institutes/ colleges for further admission process.